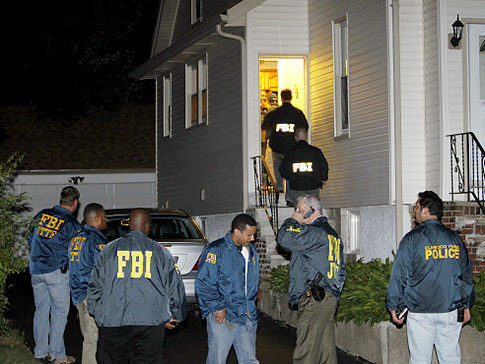 FBI raids on 40 Anonymous hackers ! The FBI would have conducted 40 raids yesterday and seized the computers of members of the loosely organized group of hackers known as Anonymous. Several members have posted their stories in online forums, including images of kicking in doors. The FBI has seized every computer in every house and other electronic devices such as game consoles and iPhones. The reports may be exaggerated, but the FBI has issued 40 orders in the case. The FBI was gathering evidence on the group's refusal of service attacks against Visa, MasterCard, PayPal and Amazon. The group has launched attacks in retaliation for actions against Wikileaks site, which has published thousands of documents from the United States filed in December. Denial of service attacks are frustrating for victims and may also cause real economic damage. They are also against the law and raids. But Anonyme allegedly political reasons in the raid. The group said in a press statement that the denial of service attacks have been similar actions against Wikileaks, but nobody has been arrested in connection with these attacks, and there was not even a sign to investigate them. According to the FBI attacks are punishable by up to 10 years in prison.